Halloween 2018 has come and gone. 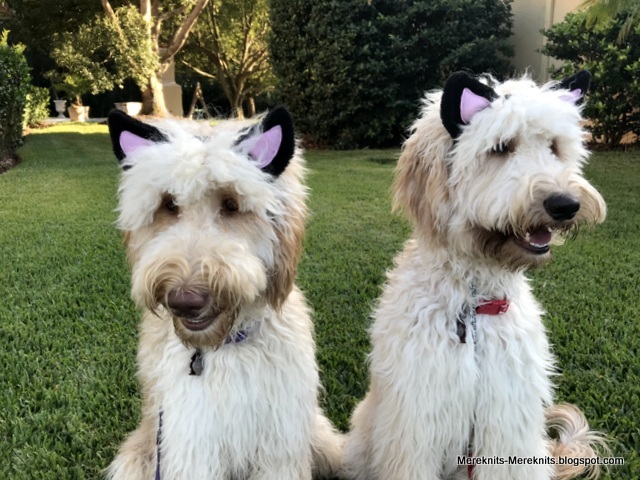 The fur boys had a good time dressing up like cats, all of the 10 seconds they had their headbands on to take these photos. Once they realized that their brother had something on their head well it was a free-for-all trying to get them off. All this fun in my front yard! Little Buddy had quite the day. We woke really early to get down to the children's hospital in St. Petersburg for a routine MRI and Neurosurgery appointment. He walked everywhere as these two appointments were in two different buildings. All is good with that little brain of his thank goodness. His neurosurgeon is always so amazed at how well he is doing. She saved his life twice when he was about 5 weeks old. After all this fun we went to Little Buddy's medical foster family where I worked on two children while he entertained everyone. He loves them so much and believe me it is mutual. On to home where he had his speech therapy and then a tiny rest time before the festivities of the evening. 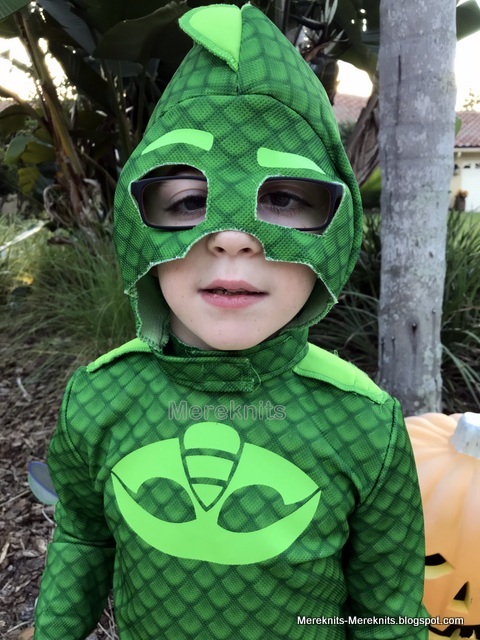 He was Gecko from the show PJ Masks on Disney Jr. This year I decided to buy a costume instead of my completely overboard themes of the past. Really, that train costume last year took me two weeks to make and all he did was wear it for 12 houses. 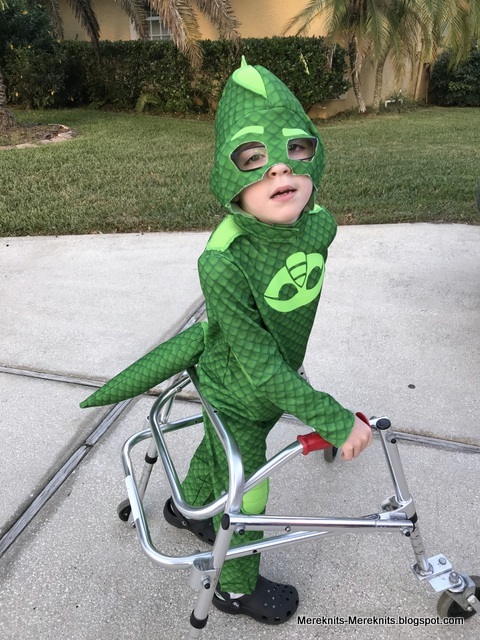 He wanted to be Gecko so I ordered the costume online. The joke was on me as when I opened it yesterday afternoon, I know last minute Meredith, it was way, way too big. I ended up cutting off the legs, which led to his crotch being way too low. Which meant I had to bring the whole bottom up at the waist, but I made it too tight. Out came the seam ripper again and I lowered it a 1/2 inch to the perfect size. But then the legs were too short, so I sewed them back on, but cut off the feet. Yikes, did you follow that? An hour of sewing and it fit, so much for not wanting to sew a costume! He was thrilled and loved being Gecko even though he only made it 6 houses before I had to carry him home. He was so tired, it was so hot out and he was just burning up in all that polyester. Still it was a wonderful night with The Aunts here from Wisconsin to tag along. Let me just say that today he had a horrible day at school and at PT after school. He is just exhausted. So it was homework, bath and a very early bedtime. Tomorrow I hope he is better. I can't imagine many of the kids had a good day today. I had just two kids yesterday not my normal 10 due to Little Buddy's appointments. Then today I had two cancel, and I had to cancel my last four because it was my day to get 35 shots in my head and neck. I think Little Buddy and I both need to be in bed early tonight. Yesterday was also my oldest son's birthday. He is now Mr. 25 and I just adore him. He is a hard worker, a great big brother, and a bit of a help at home when I ask him. He can make me laugh like no one else, well and scream a bit too if I am honest. He is growing into the man I think he should be even if he has a few edges to soften. He is off to Columbus, OH tomorrow to see his friends and celebrate his birthday. Oh, to be young again! Here is wishing you all a great weekend if I don't check in and write another post. I hope to see what you have all been up to this weekend, catching up is on my to do list. Hope your Halloween was fun if you celebrated. Happy November everyone! What a lot of Halloween fun. Hope all of you got that much needed sleep. Little Buddy makes an ADORABLE gecko and the two little "cats" are just purr-fect. No wonder your adorable little Gecko was tired; he had had quite a day. Buying a costume would seem like a good idea. Glad you were able to cut, stitch, adjust, sew and resew, etc . . . in time to go trick or treating!!! 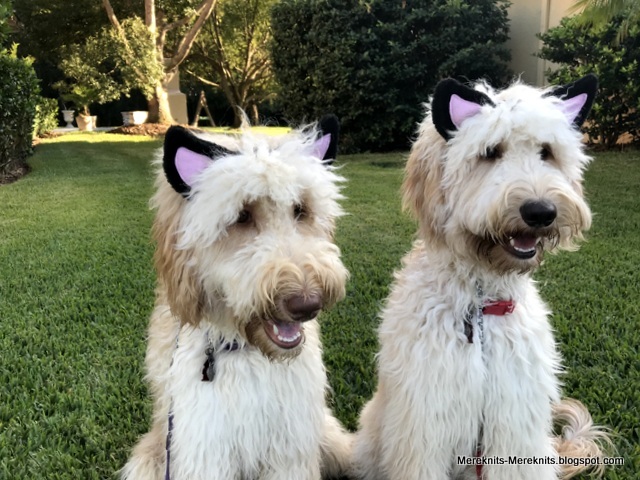 The adventures of the magic of Halloween when one is worn out - dogs looks so darn cute as girl cats (that purple !). Little angels for those few seconds. Little Buddy (Mr. Gecko) had sooooo much on one day (yes, and you did too). Hope you both slept early and energy returned tomorrow. Hugs. Little Buddy is adorable in his Gecko costume. I think there are a lot of kids who had a rough day today after last night's festivities. Hope you get some rest in. What fun costumes!!! The dogs as cats is just too funny. 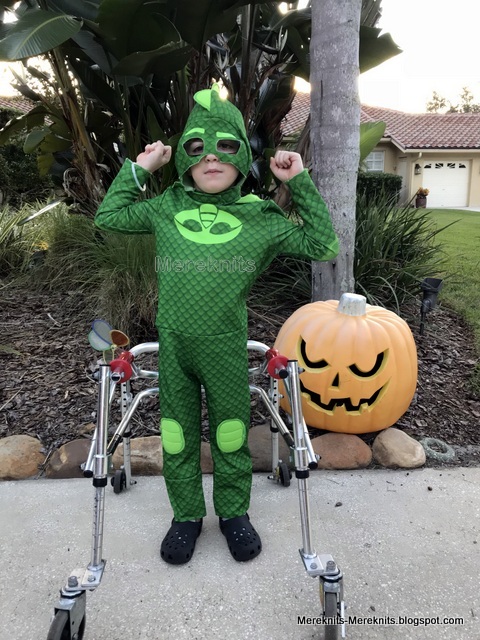 I always enjoy seeing what Little Buddy wears for Halloween. He is so cute! That was a very long day for both of you. Rest up and oh the furry boys as always are beyond cute. Mr 25! They grow up so fast don't they! Hugs! Love those "kitties" and LB, too. Have a nice restful weekend! Hope you manage to get the rest you both deserve. The costume was a delight and the fur boys certainly made me smile. oh good grief. and I thought I was in love with that other little green lizard. I think he sells something. I never pay attention. I just listen to his Aussie accent and love him! but NOW. now I love your own little green Gecko. that settles it though. I can see why my mother "let me" be a gypsy every year! LOL! just drag out the old costume jewelry. put a scarf around my head and tie it in the back. put on an old long skirt and voila! GYPSY! I was either too easy to please or I had a weird thing for gypsies or the sloth in me was already showing its lazy head! I've always liked sloths. I LOVE THIS POST. the posing cats are wonderful. they think so too. LOLOL. but then I love all your posts. Glad to hear about the good news the neurosurgeon told you. Hope you two are getting some rest! Thanks so much for your visit, Mere. It was so good catching up with you! I am trying to visit my blog friends but everything seems to be lost in the hustle and bustle of busy life. I'm glad to hear your little guy is doing well, he's a trooper! And if anyone had to deal with an ill fitting costumes, you're the girl! He looked so darn cute! When my boys were 4-5, we could barely make it around our block. 99% of the homes in our neighborhood have a good amount of steps up to the porch. Bless our mail service! So happy to catch up a bit! Awwww, dogs dressed as cats, whatever next? Don't they look cute? Not as cute as that little gecko though, such a pain about the costume but it all worked out in the end. he is precious in his costume and the pups!!! they are adorable!! 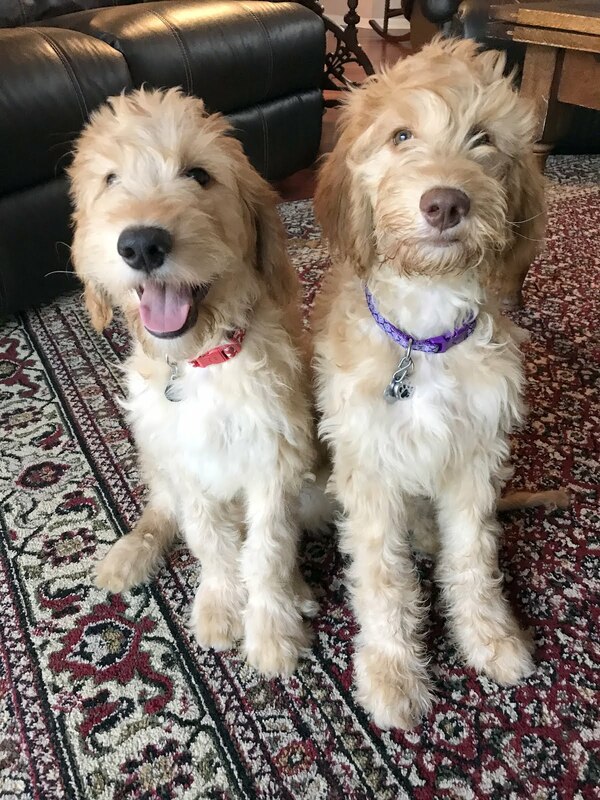 kitty ears on doggie bros? HA! Buddy is cute in the costume...wow...lots of sewing. I'd just staple it instead of sewing or duct tape? Who knows. Glad it worked out for both of you. It was raining some here and hardly any trick or treaters on our street when I got home from work...usually lots by then,,,even though we don't give out anything. We watched "Young Frankenstein"...a favorite for years! Have a good week and hope all is well where you are! Hugs! How fun! The costume turned out great. Hope you had a chance to rest and are feeling better. You did a good job on the costume - I didn't detect any modifications so well done. I hope both you and LB have recovered from your busy, demanding schedules by the time you read this. I'll be sewing today - a lining into a garment - and I am a bit intimidated by the task as I'll be using stretch fabric for the first time. I wonder if you will be in a midterm election queue today. Do you have the option of postal voting? We do here. I vote for more happy halloweens and other festive occasions and people coming together in love. Wow~ your life is so busy! I'm glad Little Buddy had such a great and busy day even though he had to 'pay for it' with being so tired. The furboys look so cute, even if they only wore the ears for the picture, it was worth it. I can just imagine you furiously sewing on that gecko costume. Looks like it fit him pretty good. I've got a resident gecko around here that sits outside my kitchen window every day. Happy belated too your eldest. I can't believe it's almost December now. Yikes! Where does the time go?